Lots have happened over the past few weeks. Everyone has or is confirming homes. Oliver, the sable coloured puppy, is staying on with the Pretty In Pink Dogs crew. More about him later. Jack, the white and black male, lives near by and visits often. Rupert, the red and white male, is being loved by a family with lots of friends and is getting lots of attention. Lucy, the black female, will be living in Montreal and the details about that are being firmed up. Last week, Oliver and Jack had their first puppy class and they got to do it together with three other larger puppies. Oddly even, all the puppies in class are all black and white except for Oliver who has black tips and has black and white hairs all over his back; I think he is going to turn grayish when he is older. Everyone is getting better about house training. Everyone is teething up a storm! I feel bad for Jack, last I saw him, his back teeth were coming out and they are bothering him so bad.... Poor little guy, it won't last forever, there is an end. Everyone is getting better about sleeping during the night and in their crates. Jack wrote to his mom... those letters will be posted soon. Details about Oliver's first day at Puppy class are coming too. More photos too. Stay tuned. Love, love, LOVE the photo! 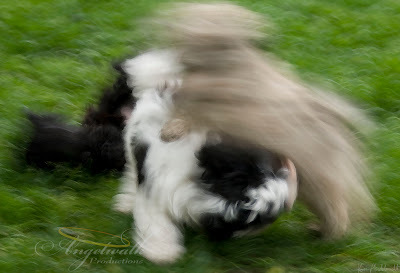 What a great way to capture the non-stop energy of the puppies at play!